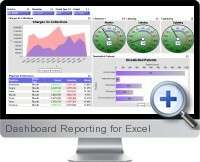 Dashboard Reporting for Excel is a versatile dashboard reporting system for Excel with a modular and easy to use design. Dashboard Reporting for Excel separates the dashboard reports from the underlying data sources enabling dashboard data to to replaced or updated easily. Many data sources can be used and no coding is required to create dashboard reports using a wide range of presentation and reporting components. Auto refresh - build the dashboard and set it to refresh the data automatically. Publish the dashboard to the web - put the Excel file on a web server and connect to it over HTTP. Visual development - no coding or VBA macro development knowledge required. Centralized presentation - the Excel data files can be stored on a web server or network drive. Common parameters across dashboard components - link all of the objects in the dashboard together. Unlimited drilling - drill down from summary data to detailed analysis without coding. Powerful charting - use speedometers, gauges, dials, thermometers and more charts in the dashboard reporting. Standard charts - use bar, pie, stacked bar, line, bubble, scatter, polar, waterfall and many other charts. Dashboard mock ups - quickly build prototypes or mock ups of dashboards for evaluation. No annual maintenance cost and free upgrades. Publish dashboards to PDF and static HTML formats.